Chill the curd till it is used. Take a bowl. 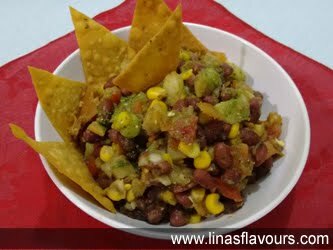 Add rajma, corn kernels, potatoes, onions, tomatoes, green chillies, salt, pepper, coriander and mix it well. Add tamarind and green chutney and mix it again. Crush corn chips and mix half of it. Add chilled curd and mix it well. Serve it into bowls. Top it up with both the chutneys and remaining crushed corn chips and serve it immediately.